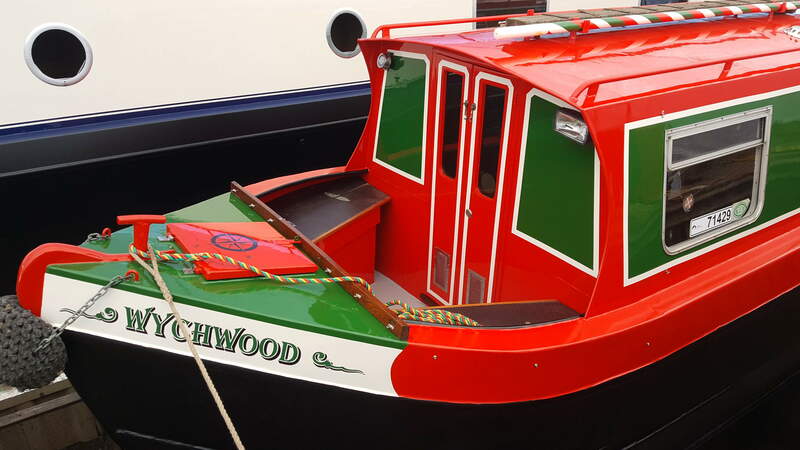 Re-painting your boat is another essential part of your boat maintenance. Done properly, it takes a lot of time, effort and materials, however, it should last many years. If you would rather let someone else do this and understand the costs involved, we can help. 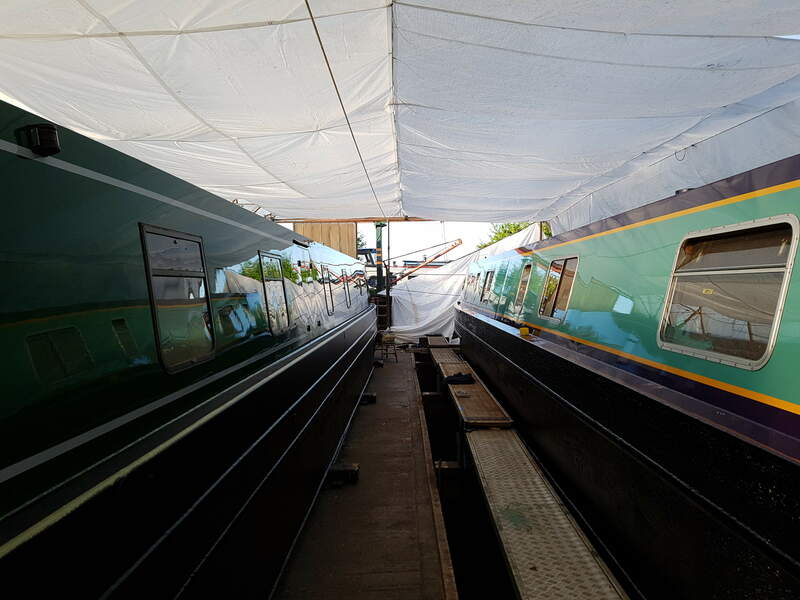 All our re-painting work is done in the covered, dry dock. 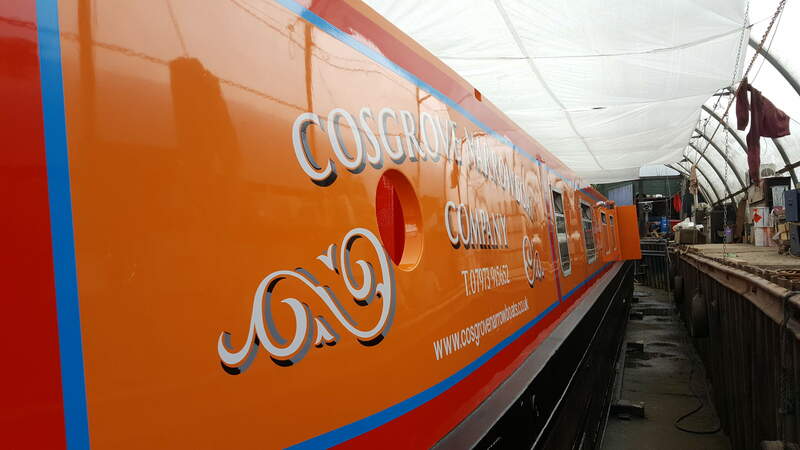 Usually, an average sized boat of 50ft will take 4 weeks from start to finish. The dock has room for 2 full length boats at a time (or 1 widebeam). 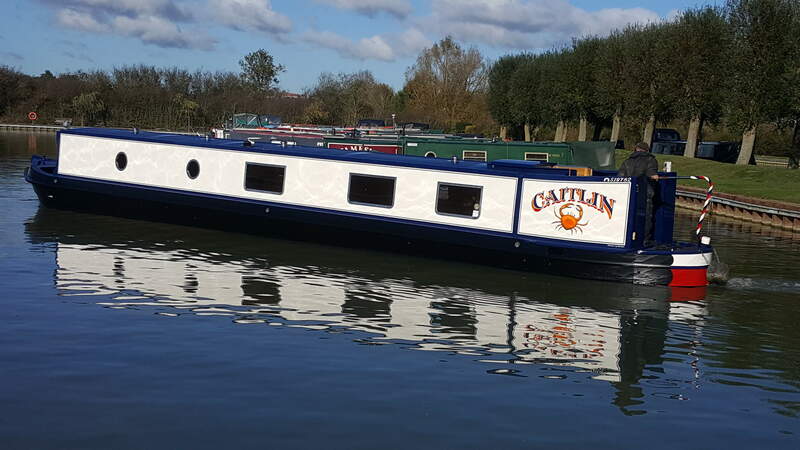 We try to schedule 2 compatible boat sizes to go in together as smaller boats of 35ft would take only 3 weeks. 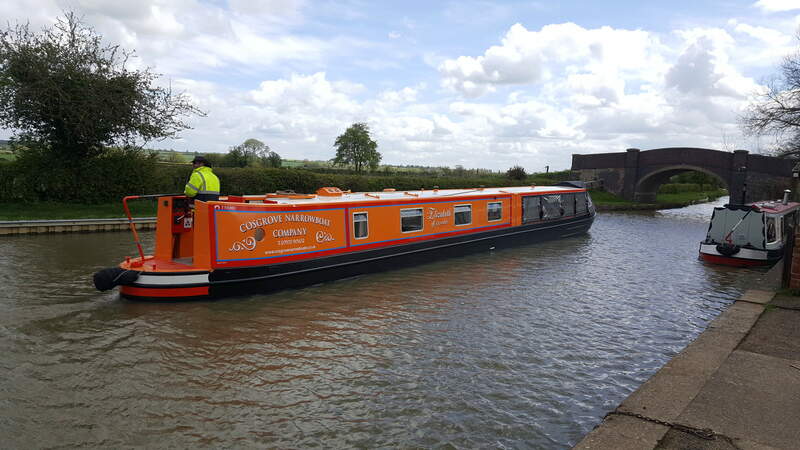 A rough estimate, based on the length of the boat can be sent to you by email, however, we must see the existing condition of the boat to assess the amount of preparation required in order to confirm this estimate. 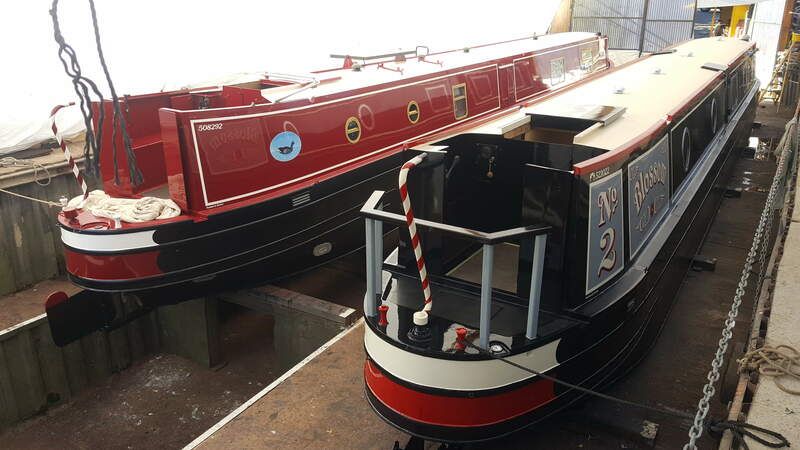 Some boats need far more time spending on them than others to get them to the same standard before painting can start. 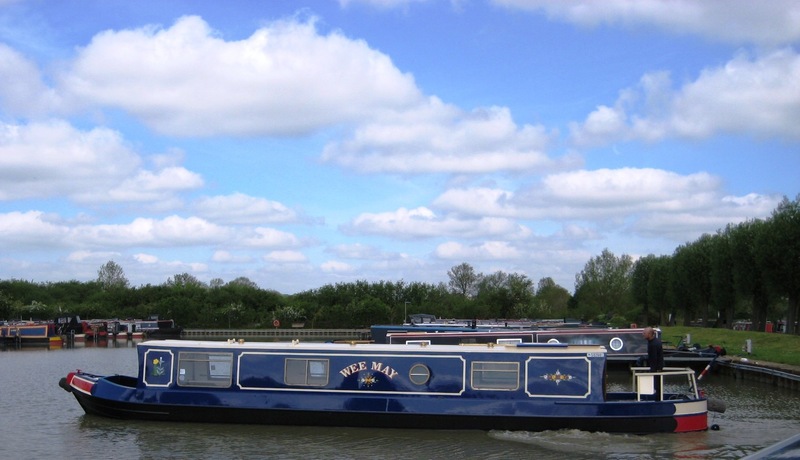 A deposit of approximately 10% of the total estimate to secure booking of the dock. Once booked, you have a free consultation to discuss the design and colours to be used. 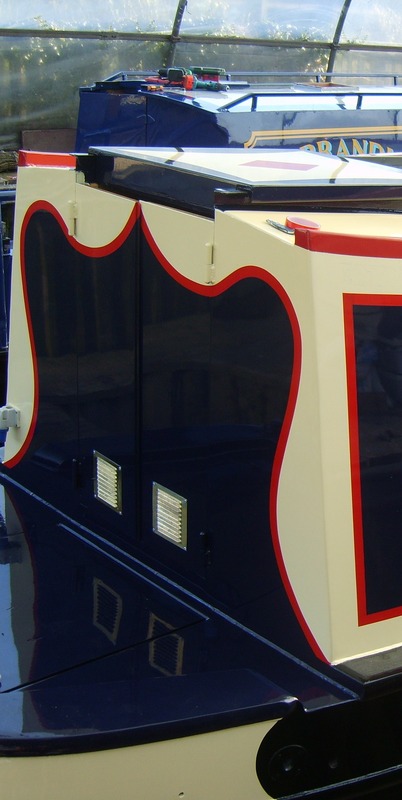 Coach lines (if any),single, double, curved or straight, the number of panels, how the bow will look etc.. There is a wide variety of styles out there and we are open to your ideas and requirements. 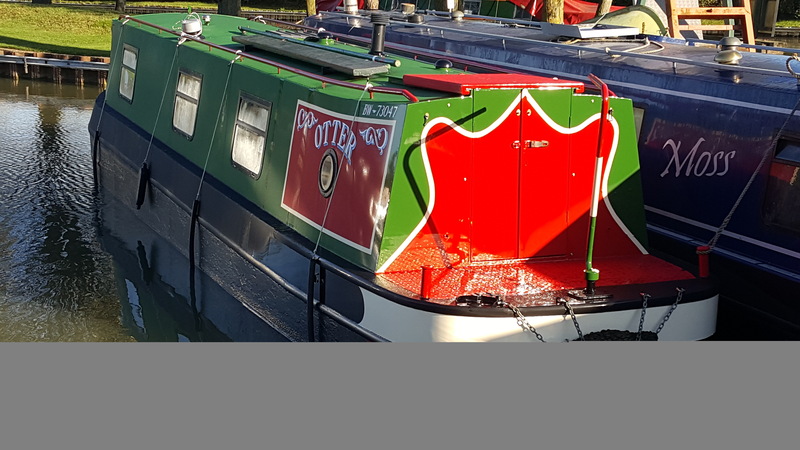 Once design and colour scheme have been agreed, we provide you with a copy to check over before you commit to the design and we order the paint. This is a chance to make any final changes. Once the dock is drained preparation can begin. Hull and dock are pressure washed to provide a clean environment to work in. 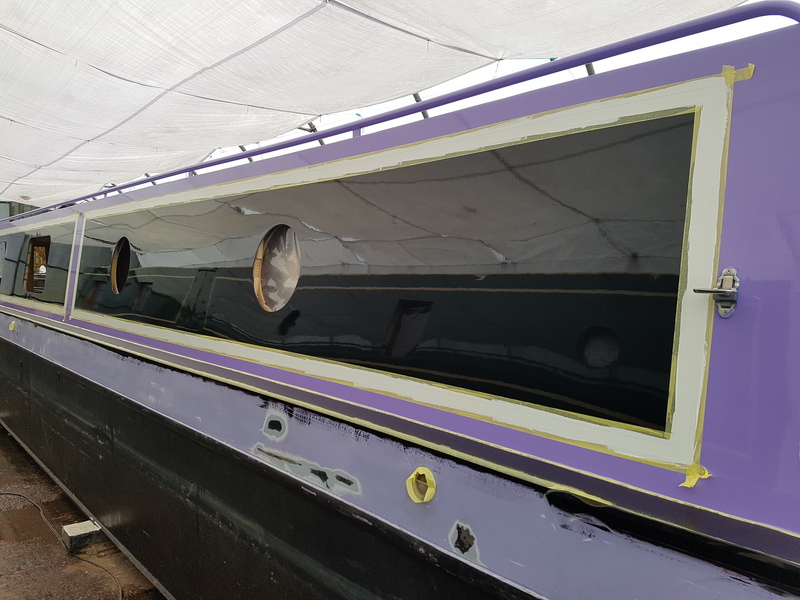 Windows, portholes and roof vents are removed and sealed with a clear plastic film to prevent the worst of the dust from entering the boat. The rest of the boat is stripped down to leave only the metalwork of the boat (aerials, Morse controls, lights, horns etc.) as rust can build up behind all of the fixings for these and cause problems later on. Any rust found is then treated. The boats are given a hard sand down. 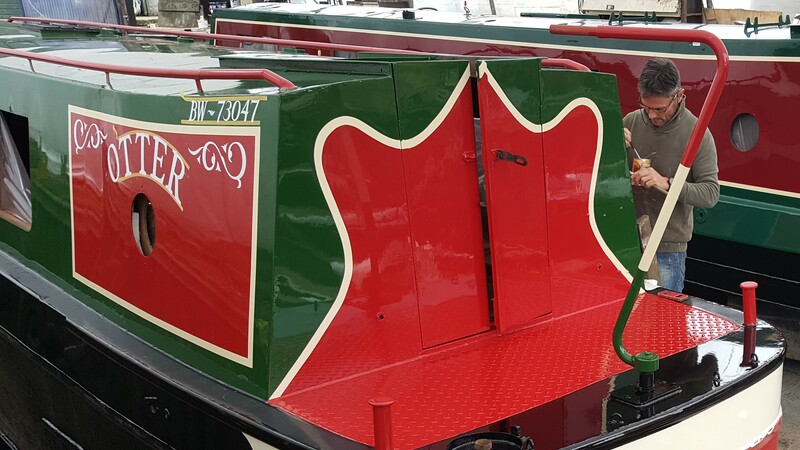 We don't take them back to bare metal unless absolutely necessary as we believe it's counter productive to remove sound layers of paint which are providing protection of the metalwork. Sections which will, ultimately, be different colours are divided by masking tape. 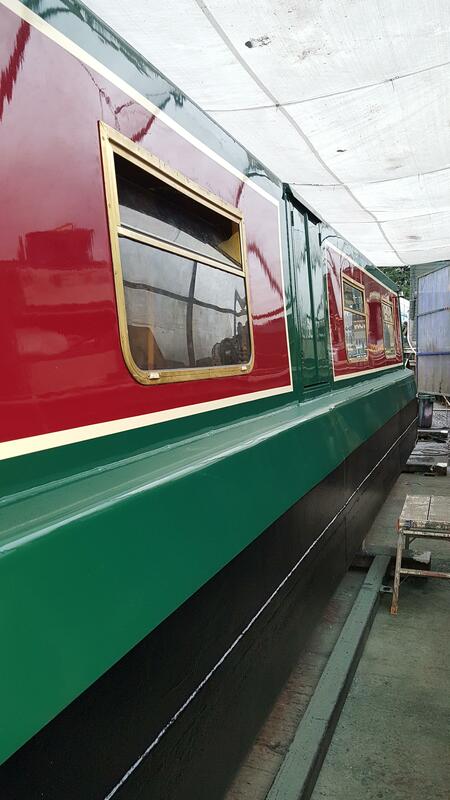 Coach lines, swan necks, panels and other areas are separated so that they can be painted with a primer to match (as closely as possible) the top coat colour. 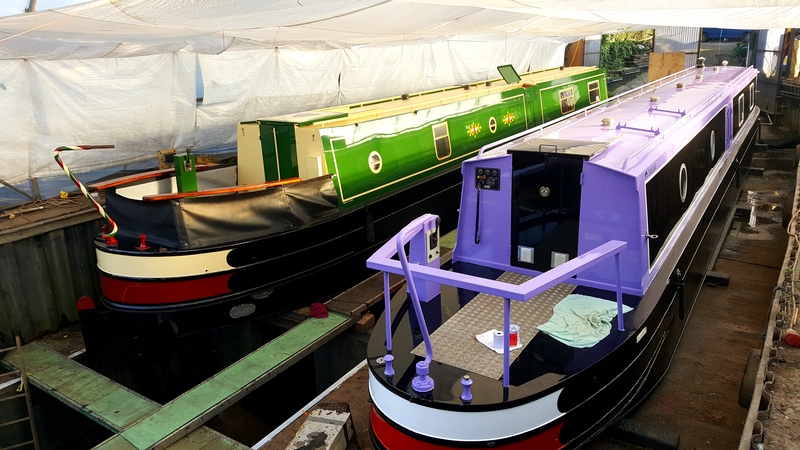 2 x coats of quality boat Primer followed by 2 x coats of Undercoat are applied in the traditional manner, with brush and roller. Any wooden doors or guard rails are sanded down in the wood workshop and given several coats of varnish or oil. 2 x coats of top coat are applied. A light key between coats with very fine grade sand paper ensures the paint sticks and is not likely to chip. 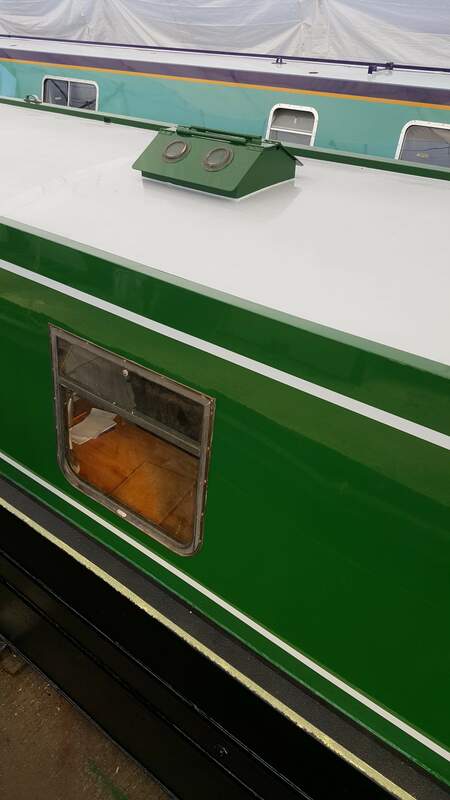 Towards the end of week 4 the protective plastic on the windows is removed and all windows, portholes and roof vents are re-sealed into place. 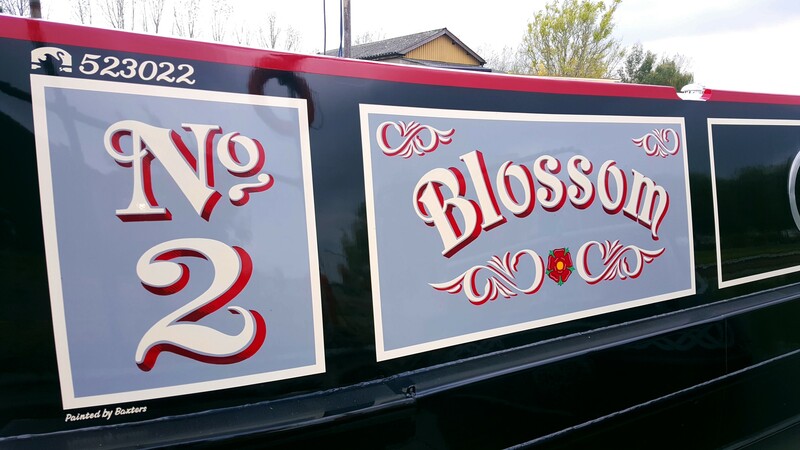 The signwriter arrives and paints your personalised lettering and/or artwork. 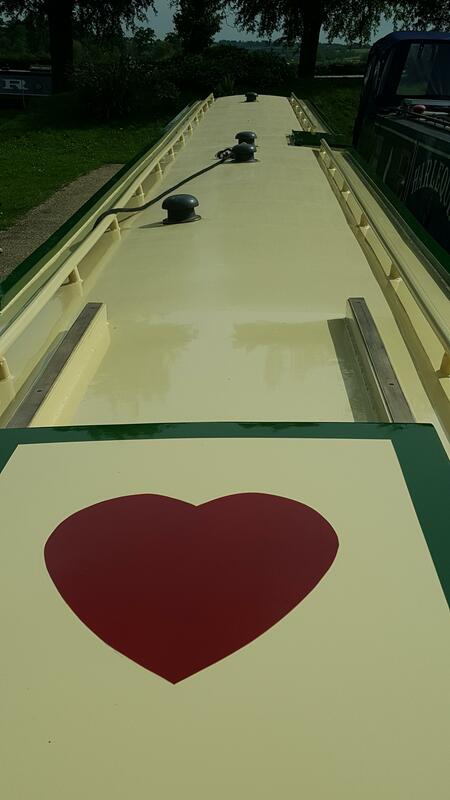 The inside of the boat gets hoovered out. Wooden rails and doors, cratch covers etc. 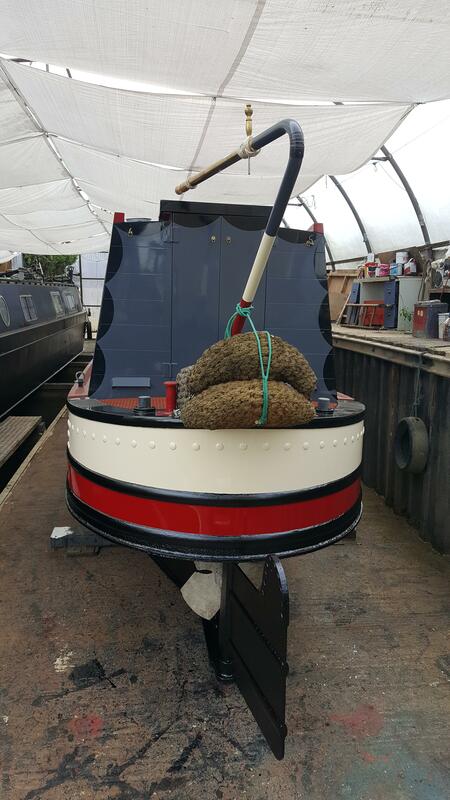 are replaced, anything which was removed is put back to get the boat ready for its' grand reveal and re-float! Monday –Finished boats are collected or moored opposite the boat yard on the pilings. 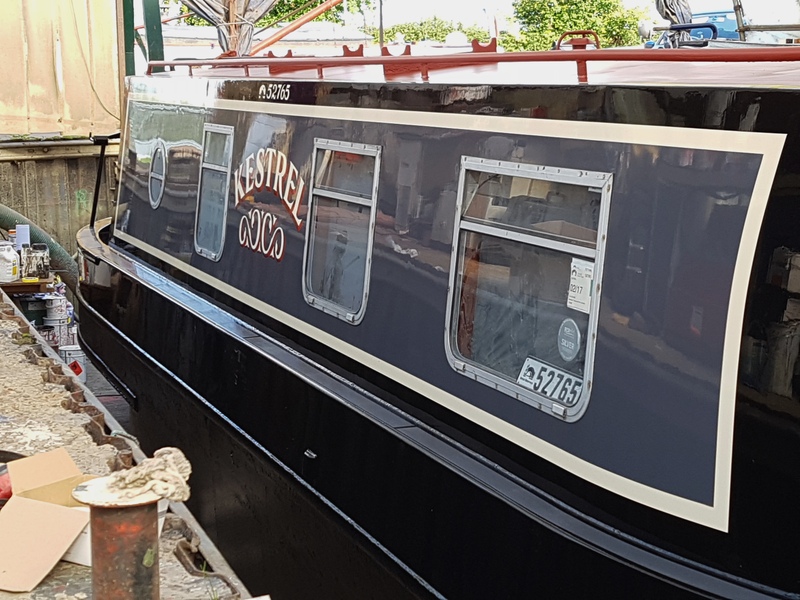 Please be aware that there is a lot of dust created by the preparation of the boats so it is advisable to remove curtains and bedding, clear surfaces and cover sofas and beds to protect them and make the clean up easier. 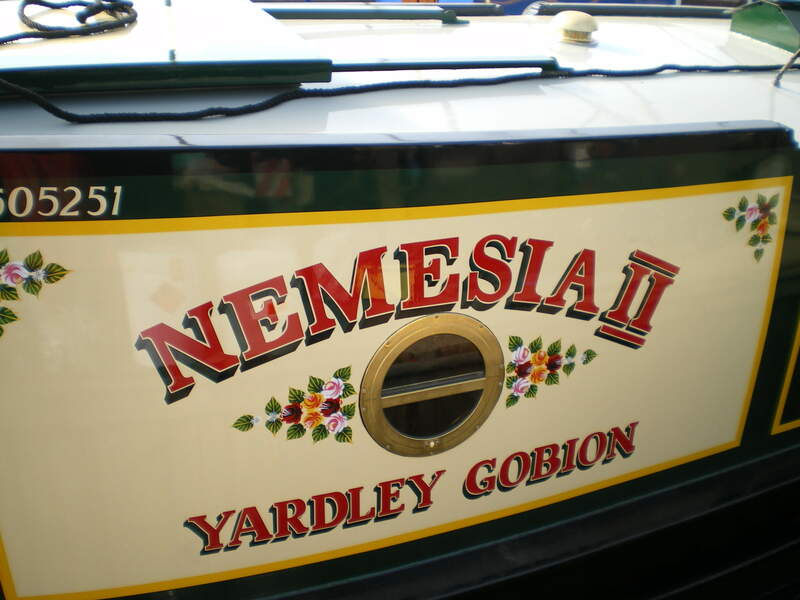 Please resist the urge to polish or clean the paintwork for at least a month after the boat comes out of dock. The paint needs time to fully harden and settle before it can take any pressure or rubbing without it causing any damage. What's included in a Re-paint? 1/2 Litre cans of spare paint for touch ups of all the main colours used. Photos taken of the whole process can be put onto your memory sticks for you. 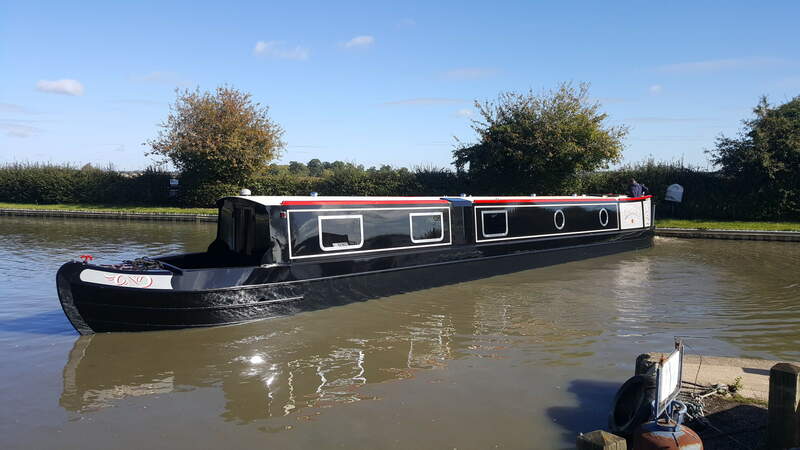 As specified when concerned with the hull blacking (see Client Information on Blacking). 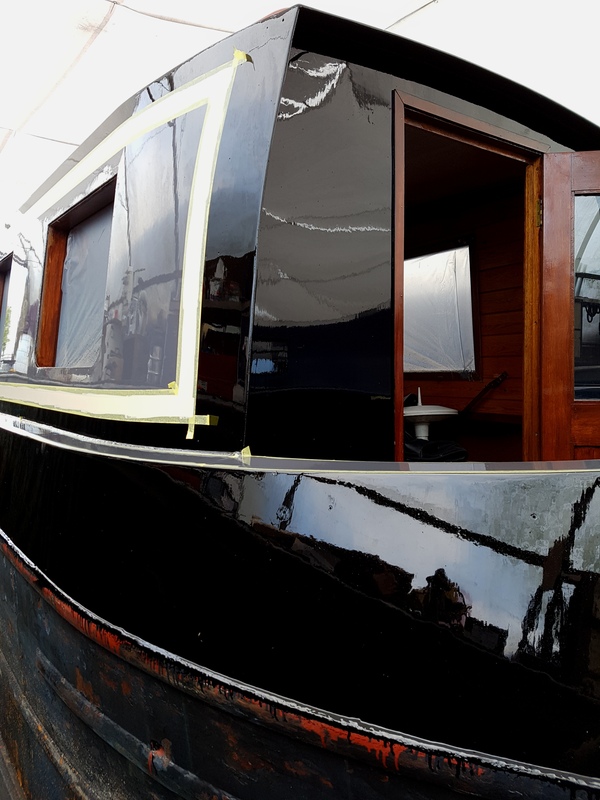 If the boat is normally blacked with anything other than bitumen we will calculate the difference in cost and this will be added to the invoice. At our discretion- coach lines, design features. PLEASE NOTE : ALL ESTIMATES ARE ACCURATE FOR 6 MONTHS ONLY FROM THE DATE OF ISSUE.